S.M. Walker, S. Grimland, N. Sampson, B. Sohngen, J. Winsten and S. Brown. 2007. Comparison of Terrestrial Carbon Mitigation Options in the Northeast United States. 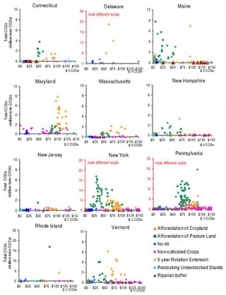 In: Terrestrial carbon sequestration in the Northeast: Quantities and costs. Winrock International.